Browsing for dining on a budget? These groups are a perfect solution! Handpicked by our staff for you, you're sure to find a table you love, no matter what your style. Take a look below! Picking up on industrial style trends, this table and stool set offers an appealing vintage-inspired look that is also designed to save space in your kitchen or dining room. The trestle frame on the table and stools is made with bar shaped tubular metal in textured black color powder coat finish. It contrasts well with the table top and stool seats that are made with pine veneers. The wood table top has a planked and wire brushed effect that is finished in medium brown and accented with large recessed nails. The dining height backless stools have scooped seats for comfort. 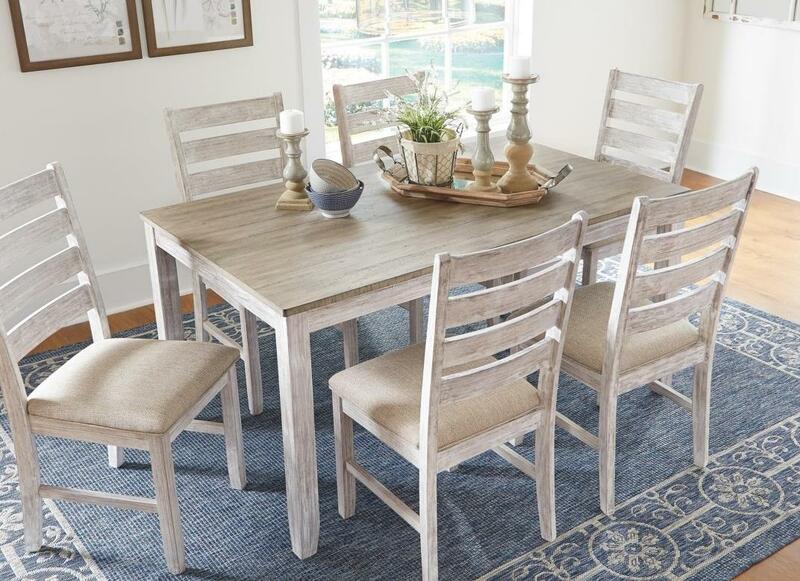 Update your dining furniture with this classy counter-height table and counter stool set. Each piece is constructed with high-quality woods and veneers, and finished in a dark cherry with mild distressing for a distinct, sophisticated look. Square, polished table top comfortably fits four seats. Ladder-back stools feature padded seat cushions for add comfort. Whether you are serving a quick breakfast or drinks & appetizers, this contemporary counter table set will fit the occasion. Perfect for your modern home, this five piece gathering table and stool set adds unique and accommodating design to your bar area. Resting at counter height, the table features a round wood top and industrial metal base. The accompanying stools, highlighted by a matching finish, showcase a button tufted upholstered seat for extended comfort and support. Fusing contemporary, traditional and industrial style elements, the transitionally-designed set will transform your dining area.